An inverter connected to a battery will have a current draw associated with its operation and it is important that the cable supplying power to these is capable of carrying the normally expected current, plus a margin of safety. If it is not capable then it is likely to result in the cable becoming hot and potentially becoming dangerous. Although fuses are optionally used in the cable to protect the battery, the cable itself should be of an adequate rating to prevent this over-heating occurring under normal circumstances. As a general rule, the smaller the diameter of the wire the higher the resistance and thus lower current capability over a given length. It is always OK to use a larger gauge cable. When in doubt about the load, go up a gauge. 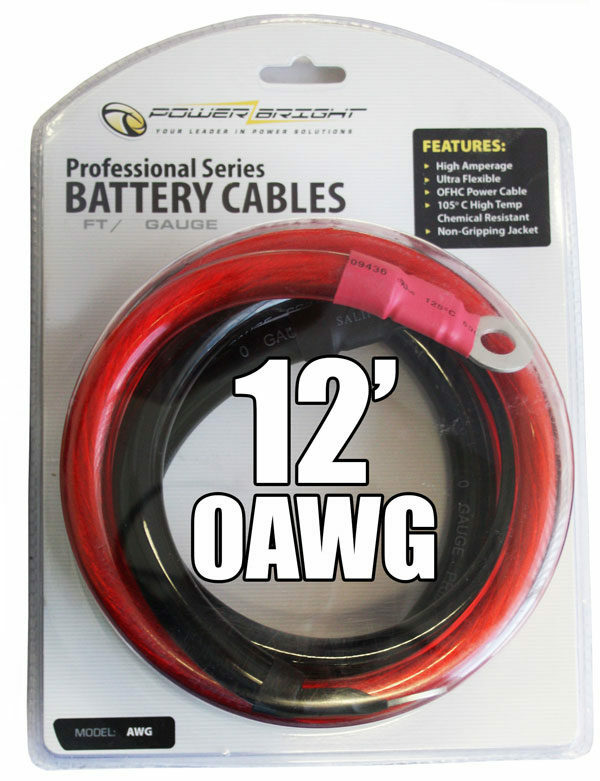 The smaller the gauge number the thicker the cable, for example, 4 gauge cable is thinner than 1 gauge cable. Other factors can affect the capacity of wire besides the length, and this includes if it is in a hot environment, duration of load, type of load etc. All cables have resistance, which means that there will be energy loss in the form of voltage drop experienced along the length of the cable.In low voltage systems cable length can have a significant impact on voltage drop. Even a cable run of 10 feet for small appliances can produce significant voltage drops and this problem is demonstrated well on some vehicles where the headlights are not as bright as they could be. If you check the voltage at the bulb connectors you might find that the bulbs are not receiving a full 12 Volts from the battery due to the wire size being too small for the cable run length. Some owners opt to maximize their inverters ability by using cable with a larger gauge over a shorter distance which allows the circuit to provide the fullest supply of voltage and amperage to the inverter. These cables are not just for inverters, they can be used for most automotive electrical applications. It's our pleasure to assist you. Copyright © PowerBright. All Rights Reserved.